We have to deintensify dairy for a whole lot of reasons. Uppermost in public discourse is water quality, but also intensification has to be sustained by increased inputs that place a burden on the environment. For example, imports of palm kernel meal has risen from 96 metric tonnes in 2003 to 1,600 metric tonnes in 2017 . This 2011 Greenpeace report outlined the carbon footprint of palm kernel. In a similar timeframe, the use of nitrogenous fertilisers in New Zealand has increased from 231 kilotons (kt) in 2002 to 428 kt in 2014. Nitrous oxide is a potent greenhouse gas that, according to MPI, “comes from the conversions in the soil by microbes of nitrogen in fertiliser, urine and dung”. Nitrogen is especially needed to pump up grass growth where stocking rates are high. reform economic practices to deflate speculative practices. Fortunately there are farms that are showing the way. Graham and Tess Smith of Paulownia NZ have a small dairy farm in the Waikato. They have two income streams, dairy, and Paulownia timber. They now have 500 paulownia’s planted and are harvesting wood. This image shows how the paulownia canopy still enables reasonable light penetration to the pasture. When the trees drop their leaves the cows love to eat them and the roots penetrate deeper into the earth than pasture roots. The Paulownia NZ website cites Canadian research that shows that trees in pasture (agroforestry) reduces “farmland nitrogen losses by 50 per cent, compared to conventional farming methods”. Paulownia is a remarkable tree, capable of growth rates of 6 metres per year, and has an expanding market. According to the Farm Forestry New Zealand website, the wood was selling for between $1,750 and $2,450 per cubic metre in 2007. Graham and Tess Smith sell their paulownia for $11 per lineal metre for 100 X 50. The timber is very light, second only to balsa wood and in New Zealand is used for boats, surfboards and skis. Here is an example of a surfboard blank. Paulownia need a free-draining soil, so are not a solution for every dairy farm , but it is great to see examples of diversification. We will look at more in future posts. 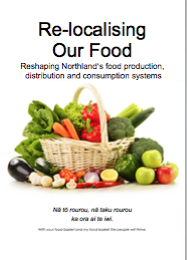 Footnote: I am not a dairy expert, but coming from a rural background and living in Northland I am very interested in how we navigate our way to a post-carbon world, and they way we grow our food is a big part of that. [2} from Australia and New Zealand Fertiliser Market and Fertiliser Usage Status, the International Plant Nutrition Institute. from Agroforestry: A New Approach to Increasing Farm Production. A Nuffield Farming Scholarships Trust report by Stephen Briggs.